Need a slideshow maker for Windows 10? A slideshow is one of the best ways to organize pictures for storage. Indeed, the majority of Windows users sometimes face hardware issues or OS updates when they need to transfer files so they don't get lost. In addition to that, there is no need to keep lots of images and manually show them one by one when you can use a Windows slideshow maker software and create a solid presentation with added text and even music. 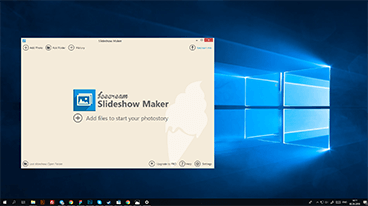 Icecream Slideshow Maker is a great software to create slideshow in Windows 10, 8, or 7. Thanks to an easy-to-use and intuitive interface, you can easily get the best results for slideshow creation. Read further to learn how to make a slideshow on Windows PC in 4 quick steps. Download the slideshow software for Windows from our website and go through the setup process. Launch the program to proceed with the photo slideshow creation. Click the “Add Photo” button to add images to the program one by one, or click the “Add Folder” button to add all images from a certain folder. The drag-and-drop mechanism is supported by the Windows slideshow maker by Icecream Apps so you can simplify the image addition process. All the added files will be listed in the image queue on the left side of the program's window. The order of the images can be changed: either drag them or highlight an image to be moved and use the UP/DOWN arrow buttons to change its position in the queue. Use the “Shuffle photos” button to randomize the order. Sorting files by their names is also available. This slideshow software for Windows has an option to set the duration time in seconds for each slide or for all the files in the queue at once (the common settings can be found under the images queue). Add audio files to create a playlist for the slideshow either by using the “Add Audio” button on the right side of the window of Icecream Slideshow Maker or by simply dragging-and-dropping them. The audio files added can be reordered. You can loop the background audio (“Loop audio” option), set offset (“Audio offset”), and fade (“Audio fade”). 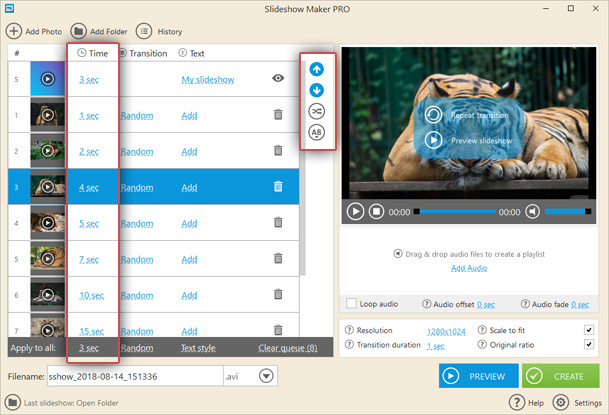 Before starting the video generation process, you can click the “Preview” button to check if the images and audio are set as intended. 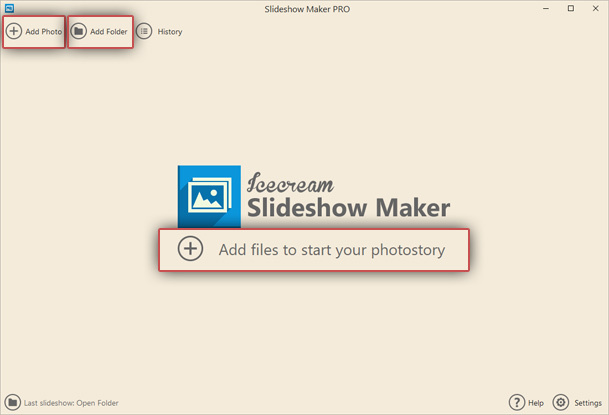 The file name and the output video format can both be changed in the lower right-hand side of the window of Icecream Slideshow Maker. Hit the “Create” button to create a slideshow in Windows 10. The progress bar will give you information on the process status – the time remaining and the time elapsed. When the slideshow creation is finished, the Windows slideshow maker will open a pop-up notification offering you the options to open the output folder; upload the video to YouTube, Google Drive, or Dropbox; or burn the file to CD or DVD. As detailed above, Icecream Slideshow Maker is a modern, easy-to-use software compatible with the latest versions of Windows OS, providing quick slideshow preparation along with advanced features.